Alyssa Yocky of Fort Lewis College goes for a rebound against Regis University on Saturday night at FLC. 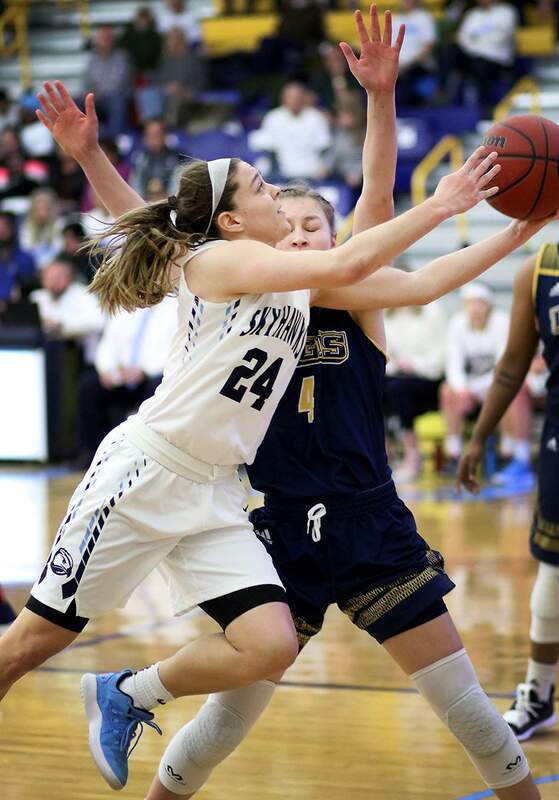 After being outrebound bad in the first half, FLC and Regis each finished with 38 rebounds on Saturday night. 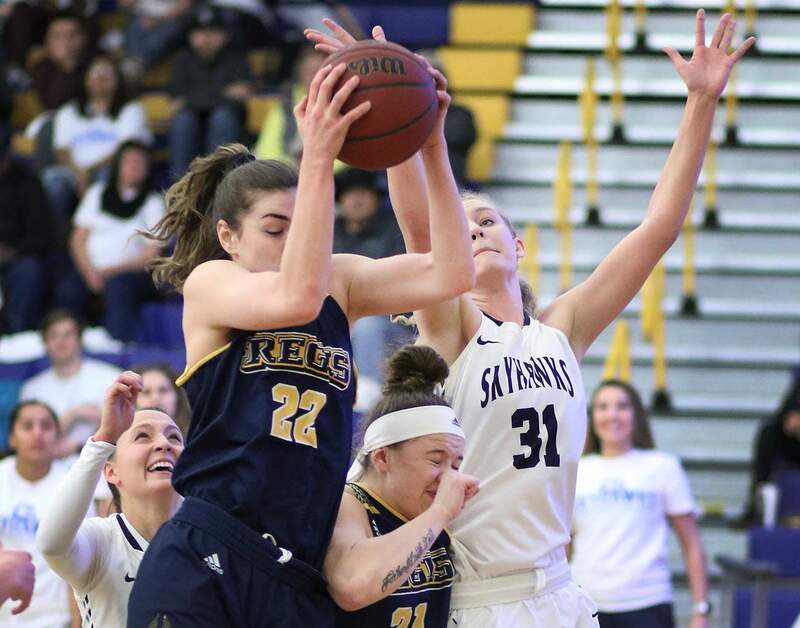 MorningRose Tobey of Fort Lewis College fights for the ball with a Regis University on Saturday night at FLC. Jordan Carter of Fort Lewis College makes a shot inside the paint while playing Regis University on Saturday night at FLC. 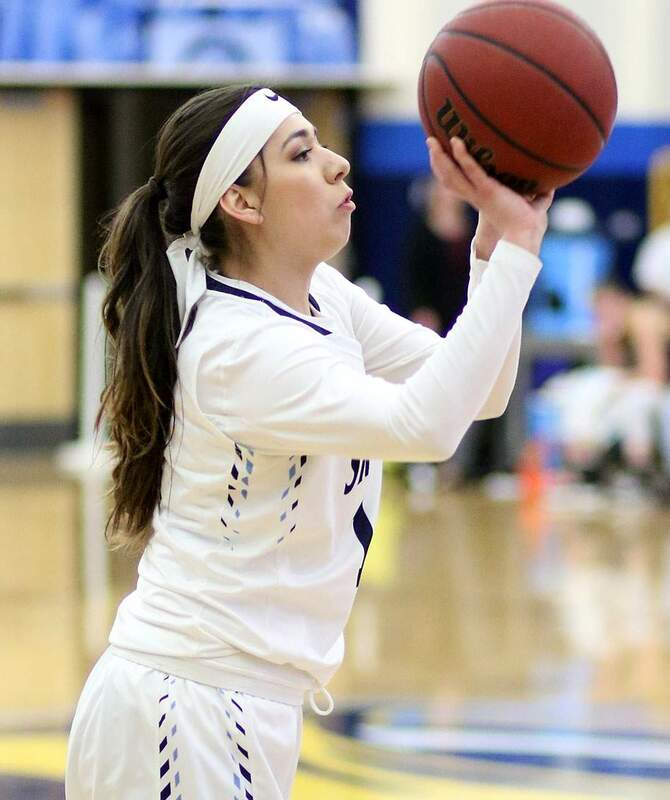 Kaitlyn Romero of Fort Lewis College puts up a three point shot while playing Regis University on Saturday night at FLC. 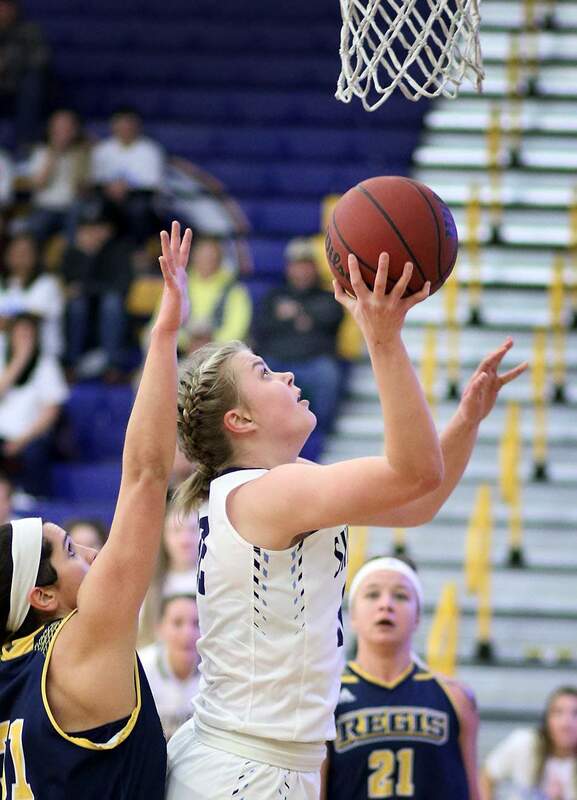 Sydney Candelaria of Fort Lewis College drives the lane while playing Regis University on Saturday night at FLC. Fort Lewis College scored nearly half of its points in the first quarter. A scoreless drought of 5 minutes, 30 seconds to end the first quarter and begin the second followed by another stretch of 3:28 without a point put the Skyhawks in a 27-22 hole at halftime against the Regis Rangers. Still, the FLC women’s basketball team had the game tied 30-30 with five minutes to play in the third quarter. Regis outscored the Skyhawks 19-9 the rest of the way to secure a 49-39 victory. 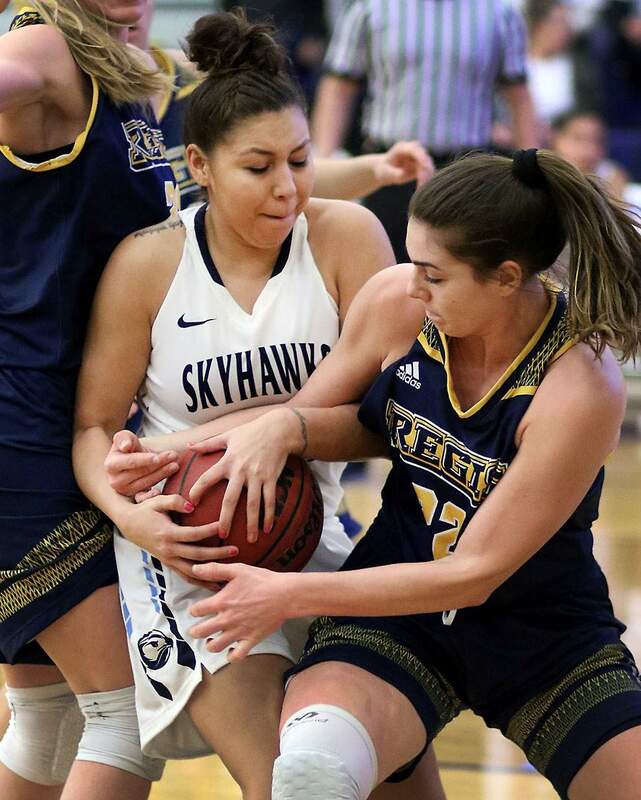 It was the second consecutive poor offensive night for FLC, as the Skyhawks followed the seven-point second quarter with only six in the fourth. FLC (9-14, 5-12 Rocky Mountain Athletic Conference) allowed Regis to collect 12 offensive rebounds in the first half. The Rangers (12-10, 8-9 RMAC) should have led by more but could only turn those second-chance opportunities into three points. FLC didn’t allow an offensive rebound to Regis in the third quarter but gave up three more in the fourth. Regis still couldn’t make the most of it with only four second-chance points in the game off 15 offensive rebounds. It was points off turnovers that Regis did utilize. FLC committed 21 turnovers and had only five assists the entire game. Regis scored 16 points off the Skyhawks’ giveaways. Kayla Herrera scored a game-high 15 points for FLC. She also had seven rebounds but turned it over seven times. Jordan Carter added seven points, while Alyssa Yocky was held to three points but grabbed 13 rebounds. [image:6}Many of FLC’s turnovers came off bad entry passes into the post. Flores said there wasn’t enough movement and entry passes didn’t come off good offense. Shelby Espinosa was a problem for FLC. The Regis forward had only five points but grabbed 15 rebounds, including six on the offensive end. FLC got back into the game by holding Regis without a point the first 5:20 of the third quarter. Majestie Robinson ended that drought with a big 3-point shot. A three-point play from Sydney Candelaria still had the Skyhawks within 36-33 after three quarters. The Skyhawks trailed 40-35 after Herrera made a tough layup, but Regis’ Whitney Jacob answered right back with a mid-range jumper. A 3 for Espinosa stretched the lead to 45-35, and an Elly Walters 3 with 34 seconds to play put FLC away down 48-39. 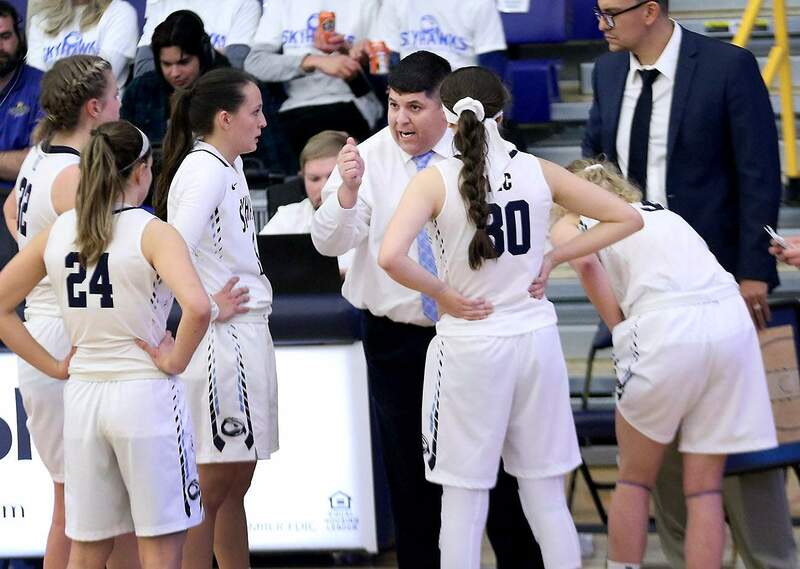 Fort Lewis College head coach Jason Flores has a conversation with his team during the Regis University game on Saturday night at FLC. Regis shot 10-of-31 from 3-point territory to FLC’s 2-of-16. Jacob led the team with 13 points to go with nine rebounds. Walters and Robinson finished with 10 each. The Skyhawks will stay home next weekend to host Westminster College, the second-best team in the RMAC standings, before a Saturday home game against Dixie State. With five games left to play, the Skyhawks are out of the RMAC tournament picture and will look to end with some positives to go into the offseason with. Yocky, a senior, will try to help the team move forward in her last few games in an FLC jersey.